One afternoon a month is all you need to prepare healthy and nutritious family meals for a whole month! This is the magic of More Freezer Meals for the Slow Cooker! Let’s face it — we are all busy. The time when we could plan a full-course meal nightly has become a thing of the past. We rarely have time to sit down and think of meals…let alone make them. It may seem hopeless to have high quality, tasty meals with very little effort. But that is what this book offers you. It takes two simple tools — a slow cooker and an afternoon for prep work. If you can manage to have both, even one Sunday afternoon a month, you can have a homemade meal every day with little effort. How do we do this? Well, the answer is simple. 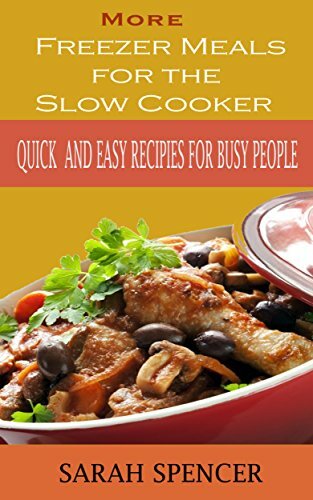 Slow cooker recipes can be prepped weeks ahead of time in just a few hours and frozen. All you need is one afternoon to cut up the meats and vegetables and store them into freezer bags. Then you can simply freeze the foods so they are ready when you are. The meals presented here are rich in flavor and will please even the pickiest of eaters. To make them, after prepping and freezing, just place them contents of the bag into a slow cooker, turn it on for a few hours, and then come home to a delicious ready-to-eat meal. It takes all the fuss out of cooking, and is budget- and health-friendly. In addition, these recipes will give you more variety than you can ever imagine. Every recipe uses fresh ingredients and the perfect blend of spices. So with all these benefits, why not get started and enjoy your freezer to table cooking immediately? Let’s get busy!